I received a great question from one of my webinar attendees and this question has also received a bunch of attention from the Kanban community since this visualization first surfaced in the summer of 2012 ago at the Kanban Leadership Retreat in Austria. 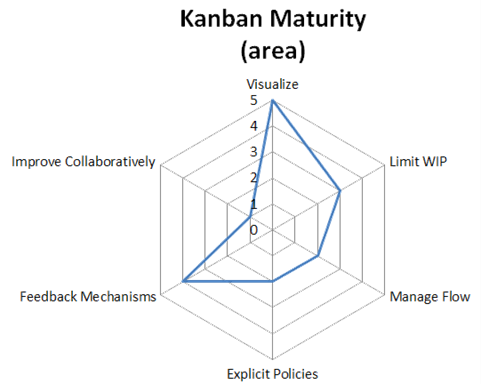 How do we measure our maturity using the Kanban method? I have used the technique that came out of Mayrhofen at #KLRAT as the basis for how I work with teams to monitor Kanban maturity. There isn’t a “standard” set of questions that the Kanban community uses in the creation of the kiveat chart. In general, it is being suggested that each team/coach comes up with a context-specific way of measuring and ranking maturity within the 6 practice groups that applies to “that team”. That visualization can then be used to monitor the anticipated growth for that team over the course of time. One thing that the Kanban community is cautious about though is “comparisons” between kiveat charts and assessments. Since each assessment is relatively subjective, comparisons should be avoided as it would be hard to compare and may potentially be misleading to the team. That said, here is how I use the chart. Observation: Does the team identify different types of work? Do they have User Stories, Bugs, Improvement Tasks, etc. described within their process? If they do not, they would be a 1. If they do, they would be a 3. I’d then look for evidence that they are capable of teaching work item type defining to another team, or that they could do so if required. If they could, they would be a 5. I go through all of my questions for an axis of the chart and give them these rankings. I then take the average value of all of the answers and that is my data point on the kiveat chart. My visualization category currently has 10 questions in it, so if I get 35 total points/10 questions, I get a 3.5 visualization score on the kiveat chart. My Limit WIP category currently has 5 questions, so 15 points/5 questions would give me a 3 Limit WIP ranking on the chart. Following this pattern, I eventually end up with 6 axis on the kiveat chart, all ranked from 1 to 5 and this “coverage” can be used to describe the team’s Kanban maturity from my perspective. David Anderson, in some of the slides I’ve seen him use and in talking to him, describes a progression of novice to experienced tactics within each category and each of his axis has different scales to represent the increasing maturity on that scale. He does arrive at the same kind of coverage visual and describes that coverage as an indicator of maturity from his perspective. My kiveat chart and David’s would not be comparable though and this is completely OK and encouraged. As I mentioned above, the current thoughts within the Kanban community are to discourage direct comparisons between these kiveat charts. What kinds of questions would you use to measure you’re companies Kanban maturity? What Should My WIP Limit Be? Super Easy Method to Find Out! January 13, 2013 4:33 pm / 3 Comments on What Should My WIP Limit Be? Super Easy Method to Find Out! Ok, I guess we don’t need the CFD if we have the data, but it sure is nice to visualize this information. 😉 We do need to have some data about the way that work passes through our system and we need the data that would be required to create a CFD. For the purposes of this post, lets assume that we are capture the time in state for each work item. Entire time in the system is often called lead time. Time in between any two phases in the system can be cycle time but we’re interested in cycle times for a single state at a time as our objective is to determine the WIP limits for each column in our kanban system. Let’s use a simple approach to measuring average time in state in days. On our simple kanban system above, we have a Ready State, Development state and a Done state. Each day, we count the # of items that have cross a state boundary and put those numbers on our CFD chart. After several weeks, we have enough data to start calculating a couple new metrics from our CFD. 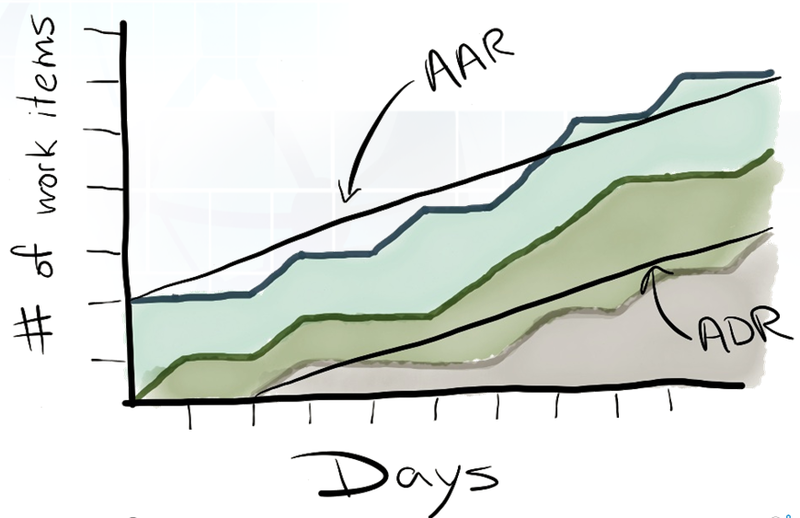 With even just a couple weeks of data that visualizes how work moves through our system, we can now start measuring Average Arrival Rate (AAR) and Average Departure Rate (ADR) between any two states in our system. 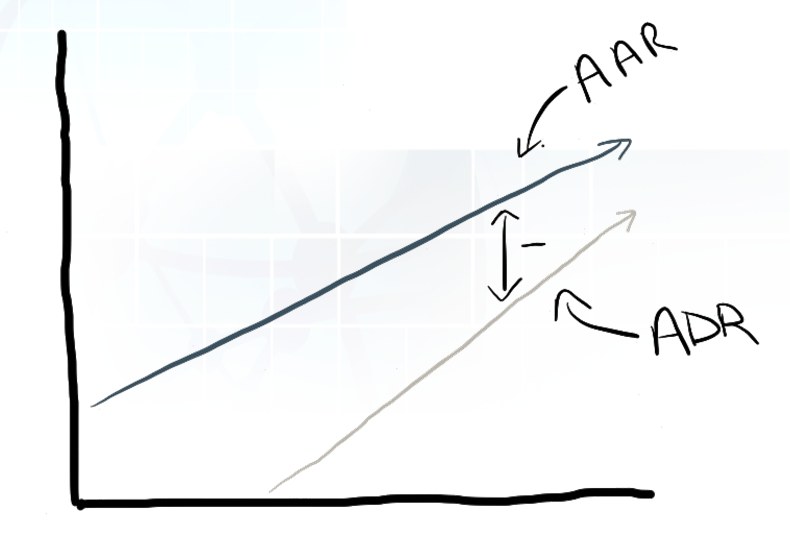 AAR and ADR are simply represented as the slope of a line. If we calculate the rise (x-axis) over the run (y-axis) values, we get the slope. It is the relationship between the two values that is interesting to us and will allow us to more empirically set the WIP Limit values in the system. Based on our understanding of Little’s Law, we are striving for a average rate of divergence between the two of near 0. A negative divergence suggests the WIP limit is to low and that we are under utilized. A positive divergence rate suggests the WIP is too high and we are overburdened. Since ADR (the rate at which we finish work) represents our current capability, the value of ADR should be considered a great candidate for the WIP limit for this state. 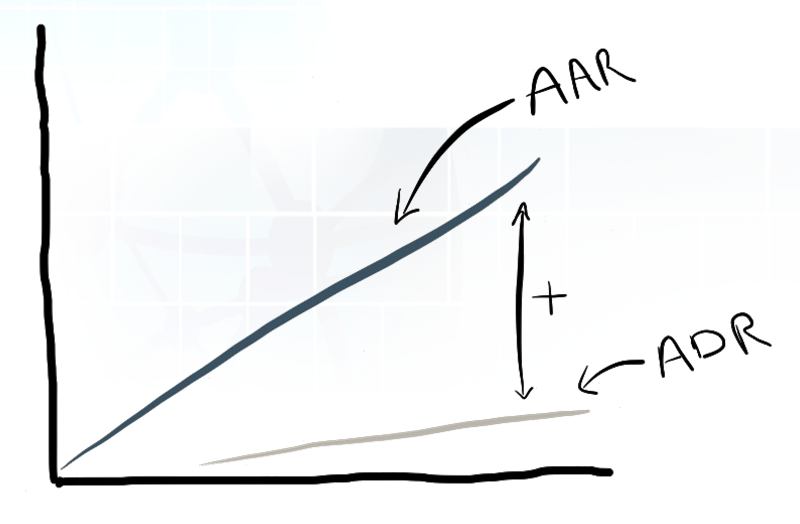 With the the right WIP limit in place, AAR should match ADR and we will find an average divergence rate of 0. As your team’s capability changes, our divergence will go either positive or negative and will provide an indication of when our WIP limits should change and what they should change to. And there you have it! 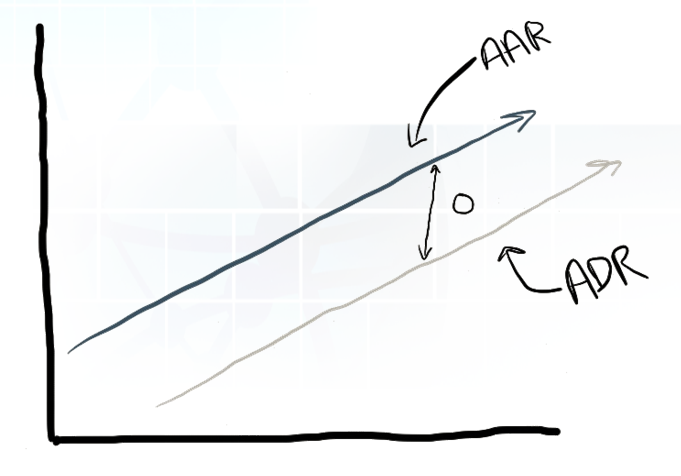 When the rate of divergence between AAR and ADR is near zero, we know that our WIP limit is right and that we’re satisfying one of the assumptions required to make Little’s Law work for us! I was recently at the Kanban Leadership Retreat in San Diego, hanging out with a bunch of great people from the community and talking all about Kanban for three days. This is an un-conference format event so we end up talking about whatever the group is interested in talking about, and one of the best sessions that we had (amongst a group of great sessions) was a session on Little’s Law that was hosted by Dan Vacanti (@danvacanti). Dan has been talking about Little’s Law at conferences for the last few months and the group was really interested in hearing this presentation as well as the interactive questions and answer that would happen throughout. It was during the interactive part of the session that “it” finally clicked for me! Up until now, I didn’t understand why I would need to use Little’s law. I don’t want to use this blog post to describe Little’s Law and besides, Daniel’s presentation does an excellent job of that. On the first point, for people running their work in kanban systems, normally all of the values are available if you’re managing your work well enough. Approx. Avg. Lead-time, Avg. Work In Progress, Avg. Throughput are relatively easily tracked or counted, and they can all be seen in a Cumulative Flow Diagram. Given I can observe all three in our system; I don’t need Little’s Law to help with that. The second point is really interesting to us but is also where we stumble upon the gotcha and the false knowledge that often occurs on teams when they are using Little’s Law. It was in the interactive session that I finally had my epiphany around this second point! It isn’t (usually) about calculating the missing number or predicting changes in the numbers. It is about ensuring that you CAN use Little’s Law at all!! That’s the tricky part and in my opinion, the really powerful thing I learned at KLRUS. See, in order to use Little’s Law and have it work as you’d expect, there are a number of really important assumptions that have to be true before you can use Little’s Law and it is in making these assumptions true in our kanban systems that we achieve the true benefit! This one is relatively easy. If you’re measuring in weeks for Throughput, your Lead time should be in weeks. If your WIP is a User Story, your throughput is in User Story. We can’t have WIP as User story and Throughput as Tasks. We can’t have Throughput as User Story/week and Lead Time as User Story/day. This one is a bit trickier, but not too bad. One of the assumptions required, as described by Dr. Little, is Conservation of Flow and this metric is one of the ways that we measure this in Kanban. And the tactic we use to manipulate this situation is our WIP limits. If we only accept new work into our system at the same rate that work leaves our system, we are stable enough for Little’s Law to work. Work that enters our system and doesn’t exit in a predictable fashion will disrupt the Conservation of Flow. AAR and ADR can’t be equal if this happens frequently in the system. We do have to watch out for work being “created” within the system that could mask abnormal termination of work within the system. Little’s Law also requires a “Stable System”, which I’m not going to explore deeply in this article. 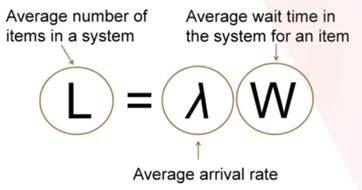 One of the two metrics that we can use from our kanban system though to determine if our system is stable is the average age of WIP in the system. Over the period of time being observed, we want this average to be constant. The second metric we use to determine system stability is WIP totals at the beginning and end of the time period under observation. If our WIP is trending up or down, we do not have a stable system and predictions that we get from Little’s Law will be suspect. So we have a law that we want to use, but in order to use it, we have to fulfill the required assumptions for the law to work. The required assumptions are going to cause us to create specific and explicit policies that will describe how our teams behave. The effects of these policies are varied, but you will see improvements in prioritization and pulling of work, queuing, swarming, workflow/system design, and WIP limits just to name a few in order to effectively strive to satisfy the assumptions. The power of Little’s Law to Kanban teams is not its ability to predict WIP, Thoughput or Leadtime. The true power lies in its ability to influence team behavior with its underlying assumptions.